THIS week has been a mixed bag at Portsmouth City Council with some decisions garnering cross-party support and others not so much. One such decision that faced no opposition was approval of a scheme to plant more trees across the city in a bid to increase greenery and improve air quality. The council’s head of planning, Cllr Ben Dowling, approved the proposals on Tuesday with support from Labour Cllr Judith Smyth. Speaking at the meeting he said: ‘Everyone in this room is committed to Portsmouth as a city and we have got a lot to do here. ‘This is something I am really keen that we move forward. We can talk further in the future about community involvement. The council is also helping to improve quality of life for people with dementia in the city. As part of a £9.75m scheme Portsmouth City Council will consider knocking down Edinburgh House and Hilsea Lodge, which are currently home to 40 residents, rather than spending millions trying to bring them up to scratch. Cllr Winnington will decide whether to go ahead with the plans at a health meeting on November 20. But political parties clashed on Friday at a call in meeting based on residents' parking zones. Councillors ultimately voted to call in a decision made in July to move forward with consultations on the zones. It was mainly based on the fact that both MB and MC zones had three new roads added to the plans without being surveyed with the rest of the areas. Panel member Cllr Hugh Mason commented: 'For me in terms of the MB and MC zones and the increase of properties in MB by 18 per cent is a very telling point. And on the basis that it has actually changed the areas I do not think the survey itself can be considered to be adequate. Cllr Ben Dowling will have to reconsider his original decision at a future date although this may not affect the future of the MB and MC zones in Southsea. Obesity in the city also proved to be a contentious issue this week. More than 250 residents signed a petition against a Papa John's and coffee bar opening on the corner of Rodney Road in Milton. 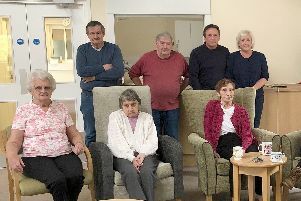 Many of the complaints came from residents of the senior apartment block Sommerson Lodge, opposite the former home of Aerial Business Communications. A decision on the plans will be made at a future planning committee meeting. But Tory Cllr Luke Stubbs believed being overweight is an individual's choice. The Eastney and Craneswater representative slammed government plans to cut calories in takeaway meals by 20 per cent. It is thought the scheme, that would see pies limited to 695 calories and pizzas to 928 calories, will be put in place by next spring. But Cllr Luke Stubbs says the plans are not acceptable. He said: ‘My view is that all these attempts to micro-manage people’s lives are going too far. ‘I freely admit that I am overweight myself and that’s my fault, I’m not going to blame the government for that. And I don’t want the government telling me what I can and can’t eat. We should be allowed to have personal responsibility in this country.